September 10, 2018 at 10:18p.m. 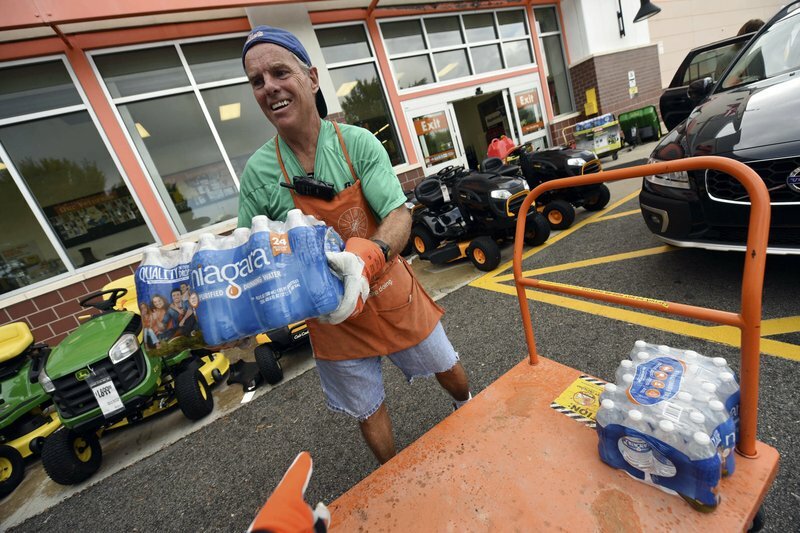 Photo by Associated Press | Chris Rayner helps customers load their cars as they buy supplies at The Home Depot. Preparations for Florence were intensifying up and down the densely populated coast. Since reliable record-keeping began more than 150 years ago, North Carolina has been hit by only one Category 4 hurricane: Hazel, with 130 mph winds, in 1954. RALEIGH, N.C. (AP) — As mandatory evacuations begin for parts of three East Coast states, millions of Americans have been preparing for what could become one of the most catastrophic hurricanes to hit the Eastern Seaboard in decades. Hurricane Florence's top winds dipped to 130 mph (215 kph) Tuesday morning, but it remains a Category 4 storm and is expected to approach the most-damaging Category 5 status as it slows strengthens over very warm ocean water off the coast of North and South Carolina. The very center of that bullseye may be Camp Lejeune, the sprawling Marine Corps training base. Tuesday's 7-day rainfall forecast showed 20 inches or more falling there, part of a wide swath of rainfall that could total ten inches or more over much of Virginia and drench the nation's capital. Some isolated areas could get 30 inches, forecasters said. The storm's first effects were already apparent on barrier islands as dangerous rip currents hit beaches and seawater flowed over a state highway — the harbinger of a storm surge that could wipe out dunes and submerge entire communities. Watches were already in effect Tuesday for a storm surge that could reach up to 12 feet at high tide on a stretch from Cape Fear to Cape Lookout in North Carolina, forecasters said. A hurricane watch was in effect for Edisto Beach, South Carolina, to Virginia's southern border, and the first hurricane-force winds arriving late Thursday. By 5 a.m. Tuesday, Florence was centered about 975 miles (1,570 kilometers) east-southeast of Cape Fear, North Carolina, and moving west-northwest at 15 mph (24 kph). Its center will move between Bermuda and the Bahamas on Tuesday and Wednesday and approach the coast of South Carolina or North Carolina on Thursday. Liz Browning Fox was planning to ignore these orders and ride out the storm in the village of Buxton on the North Carolina Outer Banks. She said her house, built in 2009, is on a ridge and was built to withstand a hurricane, but even the most secure homes could be surrounded by water, or penetrated by wind-launched debris. September 9, 2018 3:14 p.m.
September 11, 2018 8:38 p.m.